Homemade Salsa Verde! 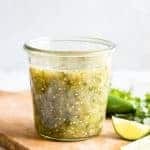 This easy to make salsa is loaded with fresh ingredients making this a perfectly healthy dip or sauce to use for dipping chips into, making enchiladas, or pouring over some tacos. Don’t buy the jar versions anymore! This recipe is quick to make at home. Add tomatillos, the white onion, jalapeño and 2 cloves garlic to a large pot. Add 1 cup water. Bring to a boil over medium heat. Allow to simmer for about 10 minutes. Remove from heat, remove the ingredients. Leave the water and save for later. Add the all ingredients to a food processor (affiliate link). Blend for about 30 seconds until all ingredients are mixed and combined and there are no large pieces remaining. Add the remaining water from boiling the tomatillos as needed to thin out the salsa to your preference. Store in a sealed container in the refrigerator. Can store for about 1 week. You can roast the tomatillos, pepper, onion and garlic if preferred. Line a baking sheet with foil, spread out the tomatillos, pepper, onion, and leave the garlic in the peel. Broil for about 10 minutes, turning the garlic and pepper over to the other side halfway through cook time. You can make this salsa milder by using an Anaheim pepper instead of a jalapeño.